The Iris are blooming now, in fact they are almost done sadly. This is one I captured last year at a home in town where the owner had all kinds of variety's of great and different colors. She does not live there any longer and the new owner mows them down. Very sad. Ah well, at least I was able to get some photos of them before they were not allowed to grow. 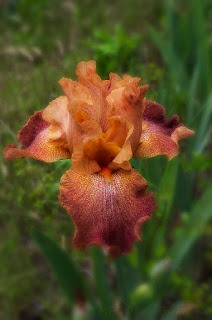 This one was a lovely peach and maroon color.